Flexible packaging manufacturers need the day-to-day ability to execute efficiently under dynamic and challenging conditions. QAD’s world class, full-feature QAD Cloud ERP and on premise ERP option, combined with other QAD capabilities offer a unique solution for flexible packaging manufacturers. The solution helps manufacturers optimize, streamline and modernize business processes to better adapt to competitive pressures in the global environment. Manufactures also gain enriched visibility into their supply chain. In addition to the full-featured manufacturing ERP, key features of the solution include planning and scheduling workbenches, quality management and enhanced material handling through real-time data collection and label printing. Improve DIFOT through better supply chain insight and accurate tracking of in-process inventory. Reduce manual process costs and errors by 50% by automating complaint management and quality-related processes. Increase inventory turns, reducing inventory by 10-25%, by using sophisticated forecasting methods and detecting demand forecast changes as they happen. Flexible packaging is the fastest growing segment of the packaging industry, providing opportunities and challenges for manufacturers. A full-function ERP solution built for manufacturing becomes the foundation for growth and scale that, when combined with other capabilities, enables manufacturers to gain control of critical processes. Flexible packaging manufacturing typically operates in a make-to-order environment that rarely delivers the same product twice. Flexible packaging is characterized by rapid engineering product development cycles and constant customization of as-delivered permutations of products. The ongoing competitive pressure to deliver new permutations condenses product lifecycles into seemingly ever shorter time frames. Capacity and production schedules are more volatile than ever too. To succeed in today’s complex environment, manufacturers need to anticipate demand changes and the related effects on procurement, production and delivery. Accurate forecasting and planning combined with better supply chain visibility help reduce inventory, improve efficiencies and accurately deliver on-time quality products cost effectively. The entire enterprise should be rooted in collaboration of shared and tightly integrated data which often results in improved forecasting and planning. The best-in-class flexible packaging manufacturer delivers the same core product from its regional manufacturing centers despite each plant possessing different equipment. The translation of product expectation to global manufacturability at the speed of consumer demand requires a cultural revolution in terms of collaboration and the systems that support that enterprise coordination. QAD’s specific solution for flexible packaging includes capabilities that address many essential business processes, for example. An overview of the first three critical processes follows. For information about the other processes, please visit QAD.com. Planning and Scheduling Workbenches generate more reliable production plans, manage exceptions proactively and respond to changing conditions. Improving production plans directly impacts on Manufacturing Schedule, Manufacturing Efficiency, Asset Utilization and Inventory Effectiveness. Planning and Scheduling Workbenches give schedulers total visibility of demand, supply, inventory, capacity and production using an intuitive spreadsheet-like workbench. Planned production, alternative resources, changes in customer demand, inventory levels, safety stock, forecast, capacity and planned maintenance schedules are centralized and managed. 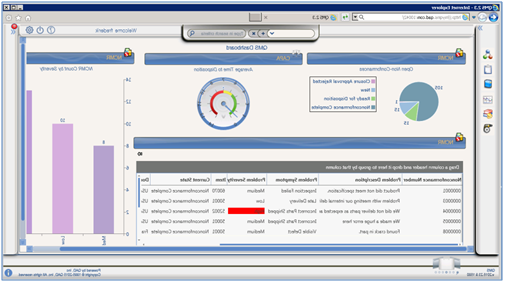 Schedulers interact directly with the schedule, with color-coded alerts that focus attention on potential issues. 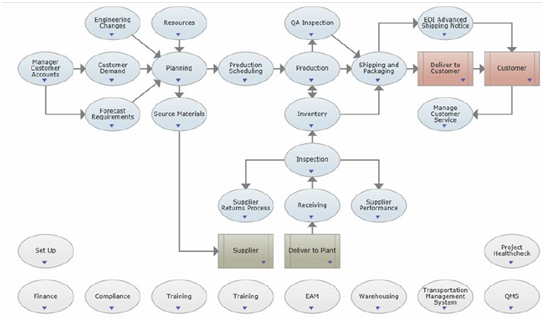 Typical measurements related to KPIs impacted by Planning and Scheduling Workbenches include Time and Cost to Schedule, Schedule Achievement, Schedule Variance, Schedule Agility, Overall Equipment Effectiveness (OEE), Capacity Utilization, Non-Value Added Time Ratio, Size of Safety Stock and Expedited Replenishment Orders. More effective planning and scheduling will reduce Sales, General and Administrative (SG&A) cost and Cost of Goods Sold, while increasing Operating Income Margin. Auditing management helps management assure that well-defined business processes apply throughout supply chains and generate the results expected. In addition, when processes are not meeting expectations, the initiation of corrective actions ensures that any problems are resolved and operations return to normal. Document control helps manufacturers manage critical documents like Standard Operating Procedures (SOP) in a centralized repository that works with automated workflows to ensure compliance. Built-in controls ensure that document changes also update related procedures and initiate retraining. 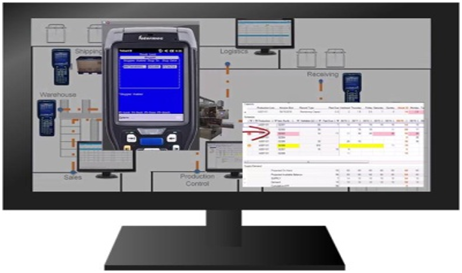 Corrective Action Preventative Action (CAPA) and Nonconformance Reporting (NCR) provide an automated closed loop solution for problem tracking and resolution, including impact on other processes or products. Training management tracks each employee, each role, skills associated with that role and training requirements for those skills. Training may be recurring, competency based, or required due to a controlled document change. Risk management enables organizations to define and prioritize each risk, create a heat map and a mitigation plan with action items and comprehensive reporting. This enables manufacturers to manage a comprehensive set of risk requirements. Supplier management helps to evaluate and select suppliers based on their ability to supply product in accordance with requirements. Supplier performance increases when suppliers are consistently evaluated, monitored and measured. Transaction Development Toolset reduces customizations by simplifying the development of material and production transactions through the configuration of QAD Service Interface. For more information on how the QAD Flexible Packaging solution can help your company, please contact QAD at +1-805-566-6100 or email info@qad.com.